"I haven't purchased magic for myself in years. Thunderbird was my first online purchase, and all I can say is WOW!" - Dan M.
Imagine if you had real magical powers. How would you make four aces appear at your fingertips? Picture bringing your hands together, in front of you, and an ace magically appears between them. Without hesitation, you take this newly-produced card, and effortlessly split it into two aces. The audience's gaze is riveted to your hands. Fearful of missing your next move, they don't even blink. The third ace materializes right out of thin air - at your fingertips. For the finale, with the cards held motionless, the fourth and final ace visually appears between the other three aces. Your audience can not speak; they don't believe their own eyes. Four aces sit attractively displayed at your fingertips, no gimmicks or trickery; just well-composed sleight of hand. Instantly, you have engaged your audience with some of the most elegant and powerful card magic possible. They swear it is some sort of high-tech optical illusion, but you secretly know - this is Thunderbird: The Modern Ace Production. four aces sit attractively displayed at your fingertips. No gimmicks or trickery - just well-composed sleight of hand. Motivation for a bare-handed ace appearance was to launch right into the Asher Twist after producing four aces. Not satisfied with all the conventional methods, Lee toiled tirelessly to invent and design a production that would fit specific needs. Tenkai Palm is the core technique used in Thunderbird. Even if you're a beginner, his clearly written chapter guides you every step of the way. 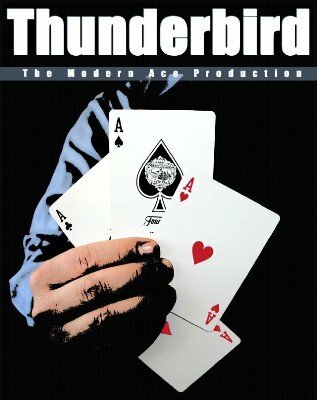 To explain Thunderbird: The Modern Ace Production the most succinct way possible, it has been broken down into five simple steps. By following these instructions, you will grasp the basic technique with a modicum of practice. In this section, several tips and techniques are discussed with the intention of drastically improving your Tenkai Palm. Even if you are already an expert in Tenkai's methods, this section should still be worthy of your time. These small insights come from years of using the technique in all types of working environments. At some point, while performing with the Tenkai Palm, you might find yourself in a situation where waiting before producing the first ace is prudent. It's awkward to remain motionless with the cards in palm position. Several comfortable 'hold' positions are offered for your use. A Small T-bird variation for a change of pace, credits, and more. As a bonus, an explanation video is provided as a learning aid. The explanation is shown from the performer's point of view and will aid in your learning process. 1st edition 2007, 24 pages. Have this awesome ace production on Lee Asher's 5 Card Stud DVD and this is a great companion for easy reference points. Well written as all of Lee's PDF's are, easy to understand and when you get this production down... BOOM... you have a reputation maker. With as much as Lee has given to the magic community over the last decade or so, I have never found anything with his name on it disappointing. Just buy it.